While some kinds of sauropod bones are common, others such as skulls are more elusive – which makes a new discovery that was coauthored by a Carnegie Museum of Natural History paleontologist very exciting. A skull discovered in a rural area of southern Chubut Province, Argentina, will give a face and name to a ten-ton sauropod that plodded around the southern hemisphere about 95 million years ago – Sarmientosaurus musacchioi. Assistant Curator of Vertebrate Paleontology Matt Lamanna worked on a team that named the new species of dinosaur, which he said will yield a wealth of insights into the biology and behavior of titanosaurs, a group of sauropods that includes the most massive land animals that have ever existed. The fossil was originally discovered by the team leader Rubén Martínez of the Universidad Nacional de la Patagonia San Juan Bosco in Chubut. Scientists from Ohio University Heritage College of Osteopathic Medicine were able to reconstruct a model of what the dinosaur’s brain would have looked like. Despite the colossal size of the animal, its brain was probably only the size of an orange! Lamanna said that Sarmientosaurus is one of the most exciting discoveries he’s worked on in his career and will provide researchers with information on the origins and evolutionary relationships of titanosaurs. 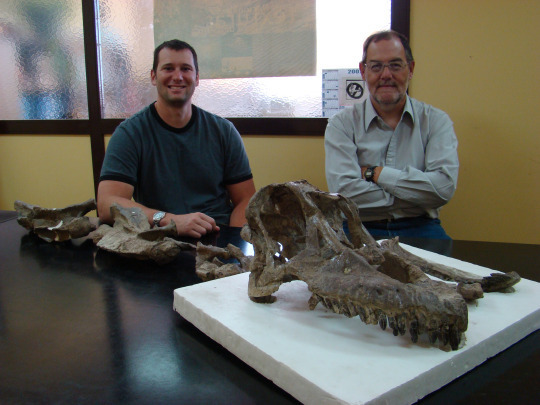 Above: Research team members Dr. Rubén Martínez (Universidad Nacional de la Patagonia San Juan Bosco, Comodoro Rivadavia, Argentina, right), and Dr. Matt Lamanna (Carnegie Museum of Natural History, Pittsburgh, USA, left) with the skull and neck skeleton of the new titanosaurian dinosaur species Sarmientosaurus musacchioi.